I showed my work for the first time at Gen-Con this weekend, and I was really pleased with the show. The booth was a lot smaller than the one I had at Origins; here each panel was 3 feet wide instead of 8 feet. I was initially upset by the small size, but once I set everything out I felt a lot better about it. Frankly, I think this panel looked much more professional than the Origins booth. The cubicle-type panels looked much neater, and I was not confined to the hook-and-hole arrangement of the Origins panels. I was really lucky in the placement, too; I was right at the edge of the row, so I got a lot of accidental foot traffic. Here was the booth from my point of view. I took my wife’s advice on table cloth materials, and I placed the prints out on the table for people to see. I also included the magnets on a white board, and drew in people’s attention with a sign that said “STOP! PUT YOUR EYES HERE” with arrows pointing to the stereo viewers. One of my best friends from the Navy joined me for the show, and we had a fantastic weekend. It was great to see him again, and his salesmanship in the booth was second to none. I think we’re going to make this an annual event. I was also happy to see MixedupZombies (MUZ) from NoobToob come by the booth. 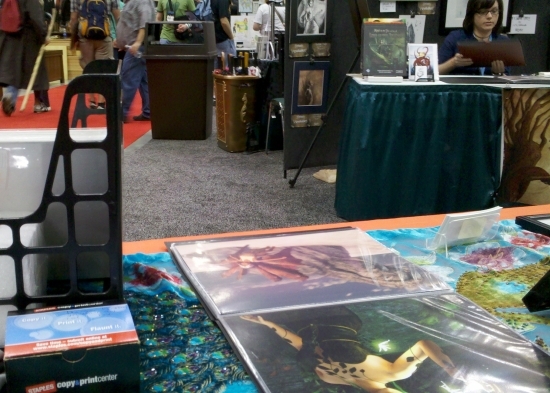 He took a shot of the booth for me, and even bought some art. Thanks a lot, MUZ; I’m glad to see you are doing well! At the end of the week, I nearly made enough to cover the cost of the booth. I count that as a win, especially since it’s my first year. My hope for next year is that I make enough to cover both the booth and the hotel. I’ll have more stories about the show in the weeks to come.